Wingbeats, photo courtesy of Dos Gatos Press. 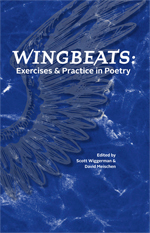 If writing better poetry is on your list of New Year’s resolutions, then you’ll want to take a look into Scott Wiggerman and David Meischen’s new book, Wingbeats. Wiggerman and Meischen, an SR contributor from Issue 7, have compiled the wisdom and advice of 58 poets in order to create exercises that showcase the poetry writing process. As a poet and former Poetry Columnist for the Texas Writer, Scott Wiggerman is no stranger to the world of poetry. He has conducted a number of workshops for the WLT Poetry Study Group and his work has been nominated for a Pushcart Prize. From the simplest activities to the more involved tasks, Wingbeats provides aspiring poets with exercises along with real poems that show what these look like in action. “We wanted to create a book that poets would actually use, and I wanted a book that would work well for poets both in MFA programs and those, like myself and several of our Wingbeats contributors, who learn the craft of poetry on their own or through the occasional workshop,” wrote Wiggerman. Wiggerman and Meischen’s new book not only covers standard poetic techniques, but also new strategies for revision, collaboration, and inspiration. If you’re looking for some hands-on experience in writing poetry, Wingbeats is a great resource. You can learn more about Wingbeats on the Dos Gatos Press website or on their new Facebook page.